When it comes to pets, most people associate dogs with speed and cats with lounging in the sunshine. While this is true for many dogs and cats, some kitties can reach amazing speeds. If this sounds strange, consider big cats hunting in the wild, like jaguars and cheetahs. The cheetah is the world's fastest land animal and can race up to 75 mph for short bursts. The Egyptian Mau are fantastic athletes that can run up to 30 miles per hour - faster than any other domesticated cat breed. They can also jump onto high-up places without problems, and some are known to leap off the floor onto their owner's shoulder. The Abyssinian is an active breed with high levels of energy and extreme smarts. Abyssinians need to be occupied with exercise, puzzles, and training. Many enjoy sports such as agility. The Somali is considered a long-haired version of the Abyssinian and are also fantastic athletes. Bengals are active cats who want attention, enjoy playing in water, playing fetch, and climbing. They are very fast not as fast as the Egyptian Mau, but very fast. A Bengal owner will need to find ways to keep the cat occupied, or they are likely to find some kind of trouble to entertain themselves. 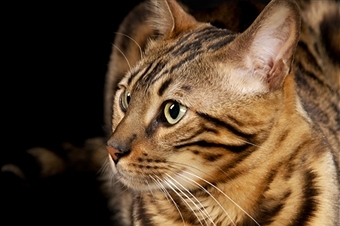 The Savannah is another exotic and fast cat breed. These cats are created from a cross between a domestic cat and a serval - a type of wild African cat and they will climb and reach places you wouldn't imagine possible. Savannahs are typically curious, smart, and agile. Simple commands such as 'leave it' can stop your dog from grabbing medicines or various objects that may potentially cause a trip to the emergency clinic. Give your dog some treats from time to time. Here's a video of what you should get as treats.